As winter approaches you don't want your car to be breaking down especially when you have kids. It's always recommended having winter tyres fitted to your vehicle for those cold icy months. Our summers are getting hotter and winters are getting colder. This year we had extraordinary amounts of unexpected snow, as always the entire country is never prepared. Even 4x4 are susceptible to poor grip when conditions get bad, however with a set of winter tyres it will make a huge improvement and safety for you, your family and other road users. These are things good to have in the boot - spare clothing for kids, blankets, mobile battery charger, energy snacks and details of your break down cover. 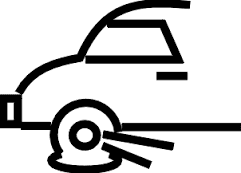 Basic car / tyre checks such as topping up your antifreeze and screen wash levels so you don't suddenly run out. For car tyres you can carry out your own 20p test which literally takes seconds to do! Simply get a 20p coin and place it into the main tread grooves of your tyre. As shown in the photo if the outer band of the 20p coin is obscured when it's inserted then you are ok your tread is above the legal limit. However if the coin is visible then your tyres may be unsafe and illegal and you need to get them checked immediately by a professional. When doing this test make sure to check at least 3 locations around each tyre. This is so easy to do yourself that you can do it once a month. Take your time when driving, a lot of accidents happen because people are simply driving too fast and not taking car in the weather conditions. The simplest things like stopping distances should be at least 10 times longer in icy / snow conditions. It is suggested to put them on around October and change them back around April. If you aren't sure the best indicator is the temperature, once it drops below 7 degrees you need them. There are a variety of different tyres varying from brand / size and price. To get new Winter Tyres online, select Jet Wheel Tyres they will be able to advise the correct ones for your vehicle.